According to site officials, OFC players will still be able to enjoy their favourite games, which from now on are complemented by the two most popular poker variations. 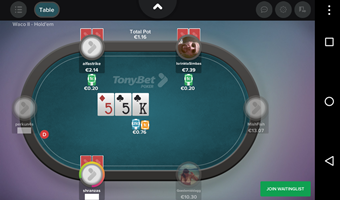 As usual with TonyBet Poker, all games are featured at the 6-max tables with the players having the option to straddle as well as run it twice. The mobile Texas Hold’em and Omaha cash games at Tonybet Poker start at micro €0.01/€0.02 stakes going all the way up to €5/€10. Players will also have the chance to try a few tables which allow antes. At first, the mobile Texas Hold’em and Omaha cash games will be available for Android users only. However, the site officials said the iOS app is currently in the late stages of production and should be out very soon. To download the Tonybet Poker mobile app, please visit the Tonybet Poker official site.